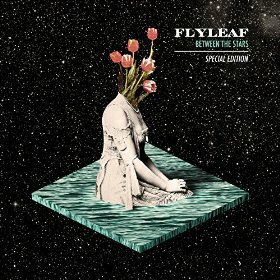 Between the Stars, the latest album from female-fronted, Texas-based Flyleaf, is the album you didn’t know you were waiting to hear. The album’s groove is a perfect blend of pop and rock with punk/grunge undertones. The album itself is wonderfully mastered, balancing the band’s deep, rich sound with Kristen May’s echoed, edgy vocals. The album is very similar to the sound of Detroit band Kaleido. The album is easy to listen to. It is beautifully simple. The album isn’t noisy, nor is it loud. Rather, Between the Stars, feels as though it was written with a purpose. It carries weight. May is able to convey every emotion, especially on the tracks “Thread” and “City Kids.” She doesn’t let her melody fall to the wayside or let it go to waste. The music and the lyrics really work together to convey her feelings. In fact, the whole album feels put together. At no point in the album are you left wondering what’s going on, nor do you feel as though there was a disconnect between the band and the vocalist. Flyleaf has really seemed to master their relationship as a band. They seem to play off each other, and even to a person’s ear their friendship is noticeable. The music feels personal and meaningful, both to the group and in turn to the listener as well. This is one of those albums that is not only great to listen to, but it is probably fabulous live as well. The heart of this album is on the proverbial sleeve. Flyleaf is really leaving their heart and soul on the floor with this one, and it’s paying off in spades.